These words are for you, no matter who you are, if you are reading this with your own eyes these words are yours. Unless you’re blind, no blindies allowed. What are you going to do with this vast inheritance of thought? You’re probably a little slow, it’s ok, I’ll give you time. Time’s up. What, still nothing? I don’t know why I even bother. People like you would eat the words right out of an alphabet soup, not even stopping to see they were there. It makes me sick. Not you guys; alphabet soup. Gross! But let’s not stray too far from the topic, no matter how disgusting those vile letters they try to pass off as pasta are. Soaking in what could only be fermented scab juice. Let’s not talk about the fact that alphabet soup has the consistency of puke, and when puked up (which it inevitably is) its quality actually improves. No, those things are for the great philosophers of the robot-future to discuss, not my humble mind (and especially not yours). Are you counting your word dollars? Even if you have been you were doing it wrong, but that’s what I’m here for. You currently have enough words to retire from speaking for the rest of your life! As your word-advisor, I highly recommend it. A life without talking is a luxury normally held by only the most prestigious of mimes. Congratulations! You don’t have to thank me, and if you’ve been paying attention you wouldn’t have considered it. I’m just glad to help the under-privileged, under-educated, and ugly people such as you. I do it for the sake of doing good for society, and your silence is all the thanks I could ask for. We are up an running for the spring semester. 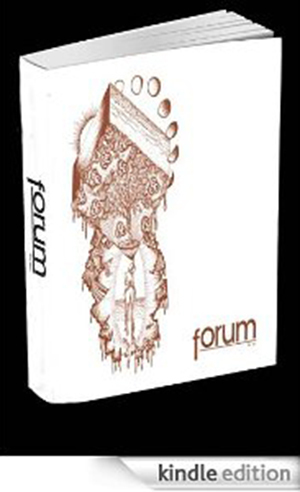 It has been a tad quiet here at the Forum Blog but hopefully that will be changing very soon with new poetry and prose and visual art showing up here along with all things related to the magazine. Most importantly, we have new deadlines for submissions for the magazine — March 1 for the next issue, which is of course very close so if you are interested in submitting something keep that date in mind. We will also take submissions on an ongoing basis for consideration in the blog and the fall issue (the deadline for the fall issue is October 1 by the way).